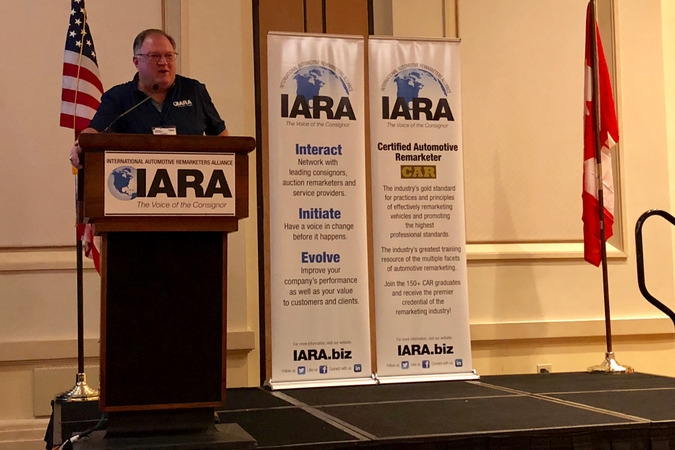 In an effort to encourage growth in membership, the International Automotive Remarketer Alliance’s membership committee collected video testimonials from IARA members at the most recent Conference of Automotive Remarketing. Amy Weisenburger of AutoVIN considers herself an early adopter of technology that the industry might not be ready for yet. In her position as senior director, national accounts inventory solutions for Cox Automotive, Allison Kline is seeing increased consignor interest in using available data to maximize values within their portfolios. Compliance in areas such as remarketing is one of Lori Murtagh’s tasks as chief risk leader for SCI Lease Corp. and SCI MarketView in Canada, and she feels that information-sharing with IARA members will help her in that role. Privacy4Cars, an app developed by Jack Cooper Logistics, aims to simplify the process of wiping data off of a vehicle to ensure personal data is kept secure. The IARA and Auto-ISAC recently formed a partnership in order to share information on data privacy and cybersecurity with the remarketing industry. Here is a short look at the woman leading Auto-ISAC. Data will be one of the most important commodities in the future. As vehicles technology continues to evolve, and more personal data is stored in vehicles, ensuring that that the personal data stored inside vehicles remains safe will be one of remarketer’s biggest tasks. The International Automotive Remarketers Alliance (IARA) loaded its recent 2018 Spring Roundtable with sessions pertinent to consignors in today's remarketing industry. Held March 5-6 at Caesars Palace in Las Vegas, sessions covered disruptions in the automotive industry, vehicle residual trends, ways of maximizing reconditioning ROI, and more. At this year’s IARA Spring Roundtable, the technology committee held a joint meeting with the social media committee to discuss what could be done to drive up user engagement on the IARA website. The 2018 Conference of Automotive Remarketing (CAR) detailed the biggest topics concerning wholesale remarketing, and also elaborated on technological developments that may impact the industry as a whole. Jim Hallett, CEO and Chairman for KAR Auction Services, accepted the Ed Bobit Industry Icon award at a March 6 ceremony at the Conference of Automotive Remarketing (CAR) for his contribution to the industry. Linda Silverstein accepted the International Automotive Remarketers Alliance's (IARA) Circle of Excellence award at a luncheon preceding the opening of the 2018 Conference of Automotive Remarketing (CAR). Auction Academy’s has added the International Automotive Remarketers Alliance’s (IARA) CAR Certification to its two-year training curriculum, effective immediately, according to a company announcement. As the technology equipped in cars continues to grow and evolve, data privacy will become a key concern for vehicles at wholesale. The remarketers of tomorrow will need to know how to properly deal with the information stored in vehicles. Following the record consignor attendance that last year’s Conference of Automotive Remarketing (CAR) garnered, the International Automotive Remarketers Alliance (IARA) will be holding a consignor-only group discussion on the first day of the 2018 CAR.